An updated schedule is here. 5:30am - My husband (Dan) wakes up, gets ready. 6:00am - I wake up and get ready. I shower the evening before, so during this time I put on my make-up, straighten my hair, and get dressed. If the baby (Ben) gets up during this time, Dan gets him until I am ready. 6:30am - Bring my granola bar, coffee, and water to the couch, grab Ben, and breastfeed. 7:00-7:20am - Change and dress Ben, get my things together, finish making bottles, run out the door. Sometimes Dan dresses Ben if I am running behind. 7:20/7:30-8:00am - Commute to work. 8:00am - Dan leaves the house to take Ben to daycare and go to work. 8:15am - Dan drops off Ben at daycare. 9:00am - Dan arrives at work. During the day, Ben ususally (and by usually I mean it happened like this for the first time yesterday and I hope it continues) has three 6 oz bottles of pumped breastmilk. I also send a fourth 4oz. bottle for him, but hope that he doesn't need it. I pump four times at work - 8:15am, 10:45am, 1:45pm, and 3:45pm. I usually average between 3-4 oz at each pump. If you are using math, you can figure out that he is eating more at daycare than I am producing during the day. I also pump once before bed to try to help that and dip into my freezer stash when needed. I started taking fenugreek, and I hope my supply increases. If it doesn't, I am going to have to supplement with formula when my freezer stash is depleted (sob). If I get in any exercise, it is during my lunch break. We have a gym in our building with a few treadmills. 5:00pm - I leave work. (My hours are from 8am-5pm). 5:30pm - I arrive at daycare to pick up Ben. 5:50pm-7:30pm - Feed Ben (just started rice cereal). Breastfeed Ben. Bathe Ben (I do this about every other day). Change and dress Ben for bed. All of these things usually take the entire time, but occasionally I can quickly eat something. 7:00pm - Dan gets home, warms up for his run, then goes for his run. 7:30/8:00pm - Ben goes to bed. 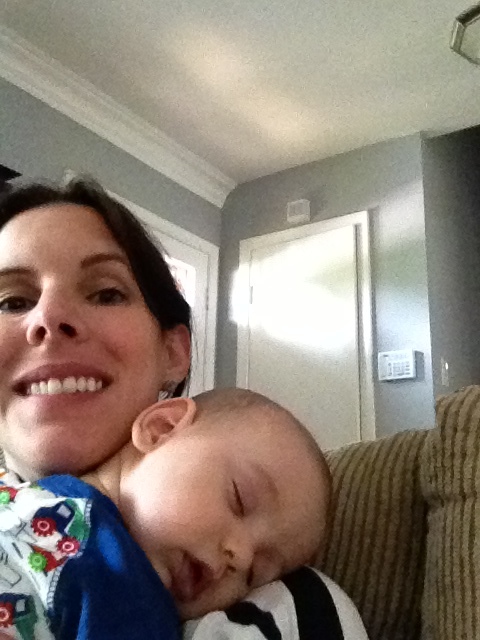 Wee hours of the morning - Ben gets up (hopefully just once),and I breastfeed him. That is our schedule. Where it really breaks down and could use some help is in the evenings. If I can't eat until 8:30 (after putting Ben to bed, showering, and washing a million bottles), I get cranky. *Did I forget to mention we have a dog? Hilarious, because our schedule used to revolve around her. The dog (Shelby) figures into the equation because she is fed and let in and out (repeatedly) in the morning and evening. We have a dog walker come during the day to take her for a walk. Once or twice a week, Shelby goes doggy day care, which is conveniently on the way to Ben's daycare.